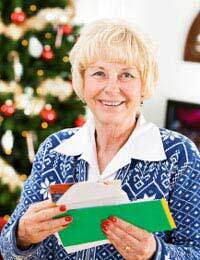 Home > Xmas Planning > Should You Do a Round Robin Christmas Letter? Ah, the round robin letter. That sinking feeling you get when you just know from the squishiness of the envelope that there’s not just a card inside. Round robin letters are rarely from the people that are open and honest about their family issues; it’s always from your old friend from university that seems to be living in a constant Hello! Magazine feature. “Tabitha has an unconditional place at Oxford already even though she hasn’t yet started her GCSEs and Tobias splits the atom in between doing his prep. We’ve just bought a château in Chamonix for cash and we are always shiny, clean and beautiful.” Grrrrrr! So why, even with the fact that we all know just how annoying round robin letters always are, do we still think about sending them? This article isn’t just about telling you not to send them though, because even though you cringe when you get those squishy Christmas envelopes through the post, part of you wants to join in the fun. Why should everyone else get to show off about their incredible lives while you just have to listen to their tales of expensive holidays and over-achieving children? You want to show off too! Here’s how to join in this curious modern tradition without it looking too much like a game of one-upmanship. It’s getting more and more popular for people to send out e-cards or simply a festive email instead of buying, writing and posting cards. It’s far more ecologically responsible and, let’s face it, far cheaper. If you choose to write a round robin letter to pop into your cards, be aware of the recipient audience. Don’t just get carried away with showing off to your poshest, snobbiest friend and forget the others that will receive it and think you’re either looking down at them or have turned into someone awful. Keep it short, positive and factual, without being too flowery. And you really don’t have to tell people about how much your holiday cost or the brand of your latest handbag/golf clubs. An email attachment is an easy way to share your year’s news with lots of people. It’s easy to add in a photo or two, just don’t have one of those cheesy ones taken at the local photographic studio with you and your family grinning like idiots. How about photos of your kids with reindeer ears or something equally silly to show you don’t take yourselves too seriously? Similarly, no pictures of your large house, new car or sparkly jewellery if you want to stay friends with the nice people. The million dollar question. You want to put your best foot forward and show how proud you are of your family and their achievements over the past year. You don’t want to look like a terrible snob who hot-houses their children and is obsessed with social status, but neither do you want to hide your light under a bushel. If you don’t shout about your family’s achievements who will? Start by saying that it’s been a great/difficult/interesting year. Talk about the highs and lows, without going into too much detail. (The people who need to know the detail already will and the others won’t care – if they do, it’s only so they can gossip about you.) Talk a little about your plans for the coming year and then wish everyone a wonderful Christmas. About 200 – 300 words is more than enough. Print it onto good quality paper – the paper will say as much about you as the letter and the card, so choose charity cards that suit your religious views and/or sense of humour without being judgemental or offensive.